Weight about 2-3.5 Kg, English Angora rabbit has very heavy wool surrounding its body including back-ear and entire face with exception at above the nose and front feed. 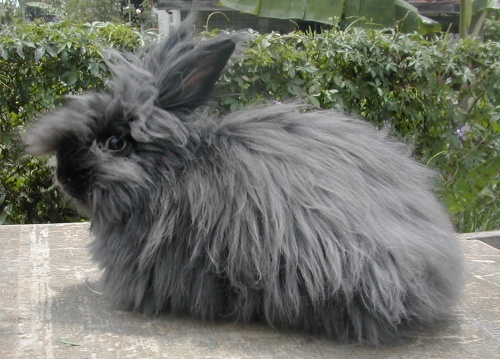 This is also the one that differentiating from French Angora rabbit, which has cleaner face. Because of its heavy wool, makes its fur very soft and silky if we touch it. This is also because it has less guard hairs compare to other Angora rabbits. At the downside unfortunately this breed requires the most grooming than others. But, as their personalities are calm and sweet, have short and funny face, beautiful and unique appearance, it’s very ideal for contest rabbits. English Angora: wool grows at all parts of the body.